The best-selling guide to finding career success and satisfaction through personality type is now thoroughly revised, expanded, and updated. Do What you Are - the time-honored classic that has already helped more than a million people find truly satisfying work - is now updated to include jobs in today's hottest markets, including health services, education, and communications technology. With the global economy's ups and downs, the advent of astonishing new technology, the migration to online work and study, and the ascendancy of mobile communication, so much has changed in the American workplace since this book's fourth edition was published in 2007. What hasn't changed is the power of personality type to help people achieve job satisfaction. This fifth edition is especially useful for millennials and for baby boomers experiencing midlife career switches. The book leads listeners step-by-step through the process of determining and verifying personality type. Then it identifies occupations that are popular with each type, provides helpful case studies, and offers a rundown of each type's work-related strengths and weaknesses. Focusing on each type's strengths, Do What You Are uses workbook exercises to help listeners customize their job search, ensuring the best results in the shortest period of time. "This is one of the most popular career books in the world. It's easy to see why. 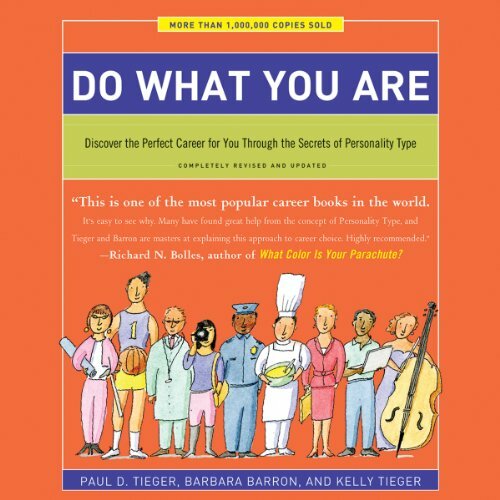 Many have foud great help from the concept of Personality Type, and Teiger and Barron are masters at explaining this approach to career choice. Highly recommended." - Richard N. Bolles, author of What Color is Your Parachute? Practical book, but seems quite long due to giving examples on all personality types on multiple occasions. Difficult to skip in audio format. The topic was interesting, but it was a challenge listening to this book as an audiobook because half of the book isn't about your type. I found myself skipping around trying to find my chapter, which I find somewhat interesting I guess. I say it wasn't worth the hassle. This book is book works well as a general reference material. The first few chapters provide a good overview of how Myers-Briggs can be adapted to the workplace and how one's strengths can be used to work towards a job that is well adapted to your strengths or as an explanation as to why a job that on the surface seems to be perfect but just doesn't quite fit. I recommend it for a good starting place in seeking out a new career or academic path. It does get muddy and difficult to navigate in later chapters when it goes into the individual types. For these sections, I would recommend a print copy of the material. great narration, stories seem unrealistic for people struggling with money, and therefore need higher/happier- income/career! I found this book to be useful and interesting, but even though it became pretty clear what personality type I fall into I found that the suggested careers didn't really match that well what I have found enjoyable over the years. I think what is far more important than your type is to list out what you actually enjoyed doing and didn't enjoy doing in each job you have had and understand why. This is included in part of the book toward the end, which kind of makes you wonder why you need to go through the whole book. I imagine for many people the personality type description is incredibly accurate, but for me it was not so Black and White. I verified my personality type using a website, several times, and got the same answer each time, but then found the description only really matched me maybe 60%. I found this to be incredibly helpful. The narration was great as well. I highly recommend. This book is not best in an audible format. For me, it tended to drone on about the MB personality types. It would have been better to learn about personality and job satisfaction visually. Nevertheless, general concepts can be applied to one’s workforce and personal development goals. The book was still interesting and enjoyable. Where does Do What You Are rank among all the audiobooks you’ve listened to so far? What about Danny Tieger’s performance did you like?